Wednesday means it’s time to talk college football and this week we continue our conference roundtables as we discuss the MAC . TSS Associate Editors Bart Doan and Terry Johnson join staff writer Kevin Causey and special rotating guests in our weekly roundtables discussing all things college football. Two weeks ago we discussed the Sun Belt Conference. Last week, we talked about Conference USA. Today we discuss one of the most exciting conferences in college football, the MAC. Joining us on today’s roundtable are Kaleb Carter from the MAC centric Hustle Belt and Alan from the Ball State site Over The Plyon. Question: Who are the players to watch this year in the MAC? After coming to a very quick answer on who I thought the player to watch this year was, I decided to really think it through and consider some other options. In the end, I just can’t shake myself from the same conclusion: It has to be Bowling Green QB Matt Johnson. The Harrisburg native (boy, they sure do grow those QB’s with the right kind of corn in Pennsylvania don’t they?) put up some ridiculous numbers in his freshman campaign of 2013. Couple a 161.7 passer rating with 3,467 yards through the air on top of 25 touchdowns and 7 interceptions, the guy was Hustle Belt’s No. 1 player going into the 2014 season. Unfortunately, Johnson injured himself in game one of the 2014 season with a hip injury sustained against Tennessee. Now if we remember back that far, and reminisce with thoughts of the 2013 MAC championship, Johnson shined bright against NIU, tossing for 393 yards on 21 of 27 passes. 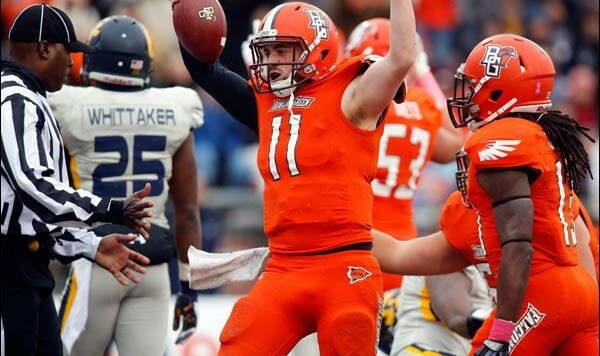 After a defeat at the hands of the Huskies in the 2014 championship game in Detroit, it will be Johnson who very well may make the difference between the folks from DeKalb and the folks from Bowling Green dancing the night away as MAC champs this year. Johnson will prove the difference in this #FalconFast team dominating the MAC in 2015 with a mind-numbingly fast and efficient offense. So this will seem like a homer pick and maybe it is, but Jordan Williams, WR from BSU is one of the best receivers you may have never heard of. Put the 6’2″ 225 pound wide out on a different power 5 level team and he’s a lock for the NFL. After three seasons in Muncie he’s #10 on the all-time receiver list for the Cardinals and he only had NFL caliber QB talent for two of those years. If it’s in his vicinity he’s coming down with it and he’s a treat to watch on the field. In case you miss him, just look in the end zone. That’s probably where he’ll be. Jarvion Franklin, RB, Western Michigan. Up in Kalamazoo last year, this guy provided the most electricity anyone’s seen from a Franklin since Ben, rumbling for 1,551 yards and 24 touchdowns. He seemed to wear down over the 306 carries he had last season, but if you had to senselessly point to one guy for purpose of a quick hot take as to why WMU went from morbidly awful to pretty damn good and capable of being in the chatter for the league championship, Franklin would be the guy. It’ll be interesting to see how he is deployed this year. WMU still recruited the position hard and was temporarily able to snare Indianapolis product James Gilbert, but he switched to attend Ball State. Franklin should be capable of understanding and succeeding in the heavy workload his second season in major college football. WMU will need him to end Northern Illinois’ reign of terror in the West. In 2013, Lewis was second in the MAC with 86 receptions. He also ran for 356 yards, returned a kickoff for a touchdown and threw a TD pass on his only pass attempt of 2013. Will Lewis be as dynamic as he was post injury and, if so, is he just the guy Drew Hare needs to really kick the NIU offense into high gear this season. The player to keep an eye on in the MAC is Toledo’s Kareem Hunt. Make no mistake about it: Hunt is one of the best – if not the best – running backs in the country. While relatively unknown at the national level, he’s every bit as explosive as NFL draft picks Melvin Gordon and Tevin Coleman. A closer look at the numbers will bear this out. After taking over as the Rockets’ feature back after an injury to David Fluellen, Hunt rushed for 789 yards and 6.3 yards per carry over the final six games of the 2013 season. He was even better last year, running for 1,631 yards and 7.96 yards per attempt. More impressively, he eclipsed the century mark in every game, and never ran for less than 5.0 yards per carry. That total includes a 15 rush, 148-yard performance against Missouri, which finished 24th nationally against the run.